At the evening of recollection I attended this week I had a chance to talk with Fr. Jay Alvarez, Wespine Study Center, who conducted our meditation talks. I didn’t know he has a YouTube Channel. Here’s one of his videos which is a “Music video about two early Christians, Junia and her brother Marcus, around year 140 AD, in Rome. Based on the books of Michael E. Giesler. Video, Music and lyrics by Jay Alvarez.” I think he’s taking the Holy Father’s call to use the digital media to evangelize to heart! I’m on the final day of my annual retreat which is put on by the Wespine Study Center in St. Louis, MO. It’s actually held at the Cedar Creek Conference Center in New Haven, MO. I like to think of it as my time to re-charge my spiritual batteries for another year. The retreat usually comes at a time when I feel like I really need it. Maybe after a number of years your soul gets into a rhythm. 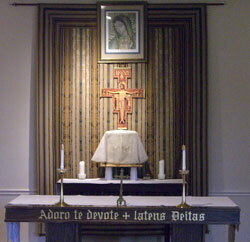 We have a wonderful chapel in which the priest presents a series of meditations and where we hold daily Mass. Wespine offers weekend retreats for working men seeking to further develop their relationship with God. The schedule includes daily Mass and Gospel reflections by a priest of Opus Dei, with Confession and spiritual direction available throughout the weekend. The retreats are held during the spring at Cedar Creek Conference Center, 14 miles west of Washington, Missouri. The retreats run from 10:30 a.m. on Friday to 2:00 p.m. on Sunday. There are also retreats held here for women that are put on by the Lindell Center, which is located in St. Louis as well.